WE MOVED – to www.42bytes.rocks – please follow us there! to www.42bytes.rocks – please follow us there! With the following method you only have to write the code for replacement once and can change the text in the Editor without digging into the source code again! The first world is supposed to be easy (one should learn how to fly) but we challenge you to get 3 stars in each level… The next world (not included in this alpha) will be harder and you will be able to actually crash your ship – and more. Stay tuned! Thanks everyone for testing MOK! just a quick update today, after spending a lot of time working on the game controls, finally had some time to draw a little bit more. Here comes the official MOK logo! And it also looks like we’ll be able to release MOK for Android at the end of 2015, wohoo! Stay tuned. we have uploaded a very early pre-alpha version of MOK so you can play it in your browser. It does not have all the features planned and still feels a bit “clunky” but we think it can give you a good first impression on how it will look like in the final version. It would be awesome if you could let us know your first impression after you played it. Even if you just played it for a few seconds or minutes, all input is very welcome! MOK – our beloved crash-test alien! Now as DIGGER is sort of our baby, obviously we don’t want to stuff it up. That’s why we decided to bring out a mini game first to test the waters. And although this game started out purely as a crash test dummy, we came to love it! It’s designed entirely in pencil and it’s about a cute little alien called MOK who is picking up his alien friends to attend a party. The player is responsible to navigate the alien ship through different worlds (spiky field of thorns, moving bubbles etc) and tries to land beside his friends who excitedly jump up and down and then join him in his little ship. The whole game design is in black and white pencil except for the “fire” coming out of the rocket jets and the ship can only be navigated upwards and to the sides. The goal is to get to the alien friend as fast as possible. The less time it takes the player, the more points he gets in the end. Those points will be reduced if the landings were more than ungraceful or if the ship bumps into obstacles. The navigation part is tricky because the rocket fuel keeps the ship moving; if you navigate to the right and release the button, the ship will continue to the right for some time depending on how long you pushed the button in the first place. Brakes are non-existent (much to the delight of X-Byte, the speed lover). It was a nice change from the usual routine of spending the whole game dev process at the computer. Actually sitting down and doodling around is quite relaxing (especially for those nerdy eyes). We had way too much fun trying to come up with new characters – there will be lots more to meet in the final version of the game. there is a plethora of free programs you can use for your mobile app game development, and this list is far from complete (it’s not even a list really, only two programs). Access to game tools in general and free ones in particular has never been greater. It seems weird that we only use two such tools, when there is so many to choose from. 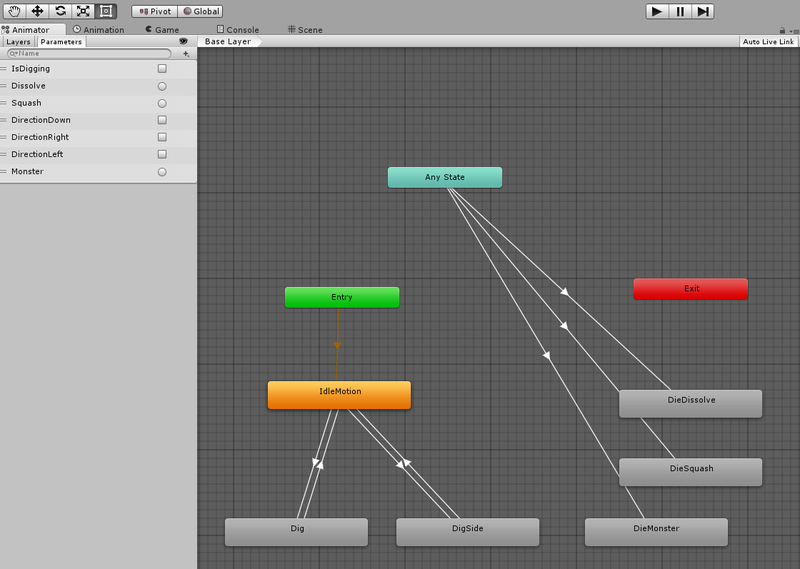 Unity is a tool specifically designed for game development – and oh boy it is good! It takes a bit to get into it but once the switch flips you’re in. 🙂 As yBYTE (our coder) has a lot of experience in C# programming the development part is fairly easy for him. This tool comes with a passionate and very helpful community. Don’t forget to follow them on Twitter or Facebook to keep up with all the upgrades. We also use Unity for the animation of our characters. Animation controller screenshot for DIGGER. For our first game DIGGER we use Inkscape to design and create vector graphics. (Oh the secret is out, DIGGER is 2D!). We just started using Inkscape, and if you never have used similar programs before it can be a bit intimidating. But there are so many free tutorials out there and with a bit of practice everyone gets into it. Other programs we might use for future games include Qubicle (a program to design 3D elements) and Harmony (software for drawing and animating characters). Those programs are not for free, and that’s why we decided against it for now. DIGGER is a leisure time project and not designed to make a lot of money. If it does however, we might buy these goodies in the future. Every now and then I started building a game but never really pushed through and published it. Which is a bit sad as I think (as we all do) that I have great ideas – and could never give you all the opportunity to play one of the incredible games I could make :D.
Now I teamed up with xBYTE and founded 42BYTES with her to change exactly that. She will be responsible for Marketing and Graphic Design while I am the Hacker and Game Designer – but she’ll tell you more about her part another day. The most important goal for us is to actually publish games – not just doodling around. So stay tuned for updates and follow us on our social media profiles. At the moment we are busy setting up everything and getting used to all the tools we use, Unity and Inkscape for example, setting up Facebook, Twitter, Email Accounts, etc. etc. We are also working hard on the prototype for our first game which we will show you as soon as we can. Thanks for reading and keep building awesome games folks!